Load Capacity and Upright Frames Our uprights (galvanised frames) have a load capacity of up to 9000kg. This refers to the maximum load capacity for the entire bay of pallet racking irrespective of the number of levels of beams. Many people assume that the higher the upright frame - the more you will be able to store. This is not the case. If the profile of the tube and the thickness of the steel is the same, the total capacity of the upright is the same. We have two profiles available: 2438mm, 2743mm & 3048mm high uprights have the same load capacity of 8000kg with the 4267mm, 4877mm, 5791mm & 6096mm having 9000kg. Only by increasing the thickness of metal, or using a stronger steel can you achieve higher total capacities per bay. Tricky! Load Capacity and Beams Beams aint beams. Although they look the same, they come in many different profiles, sizes and styles. The way the beam is constructed affects its ability to carry heavy loads. We use a 100mm profile (this is the height of the beam as you look directly at it) and 4 connectors (these are the hooks that lock into the upright. This gives our standard 2591mm beams a load capacity of 2299kg per pair. However, this doesn't mean you can store 2000kg on one side of the shelf and nothing on the other side. The 2299kg must be a uniformly distributed load (or UDL) across the lenght of the beam. While we are on it, the longer the beam, the lower the load capacity. 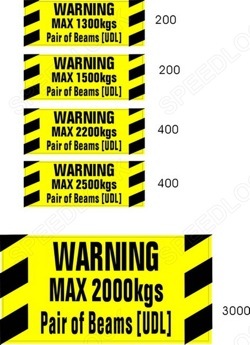 If a company claims that their 3600mm beams have a capacity of 3000kg and the profile is the same -- you have to be highly sceptical of this claim. Sort of defies the laws of physics.But this also means that smaller beams can have much larger capacities. A useful trick if you have very heavy pallets. Just setup a small bay of 1372mm beams and the problem is solved. 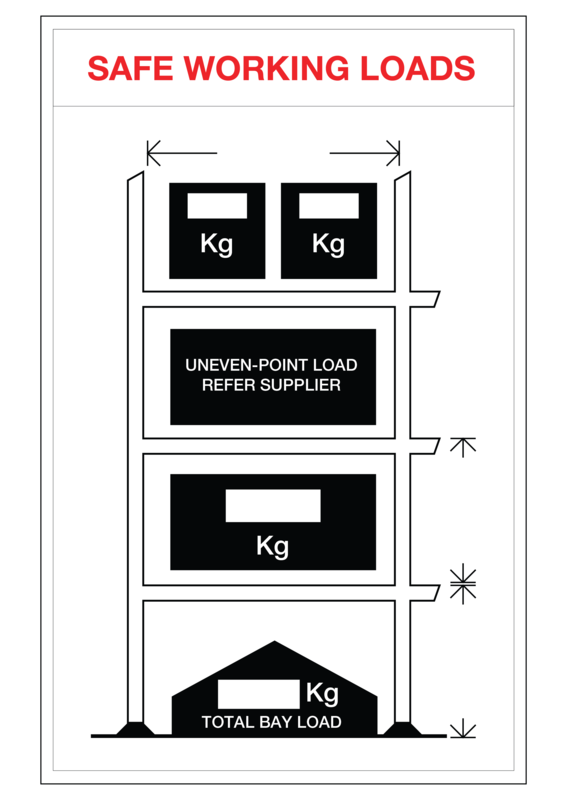 The combined load capacity of each bay - possible problems Problem: each bay has a capacity of 9000kg and each level has a capacity of 2299kg. What if you have 4877mm uprights with 5 levels of beams. If you loaded up each level to its maximum you would have 11,495kg and breach the total capacity of the upright. So, if your pallets are close to the load limit it doesn't help going any higher. A possible (and popular) solution is not to have a bottom level of beams -- just put the pallets on the warehouse floor -- it has an almost unlimited load capacity! 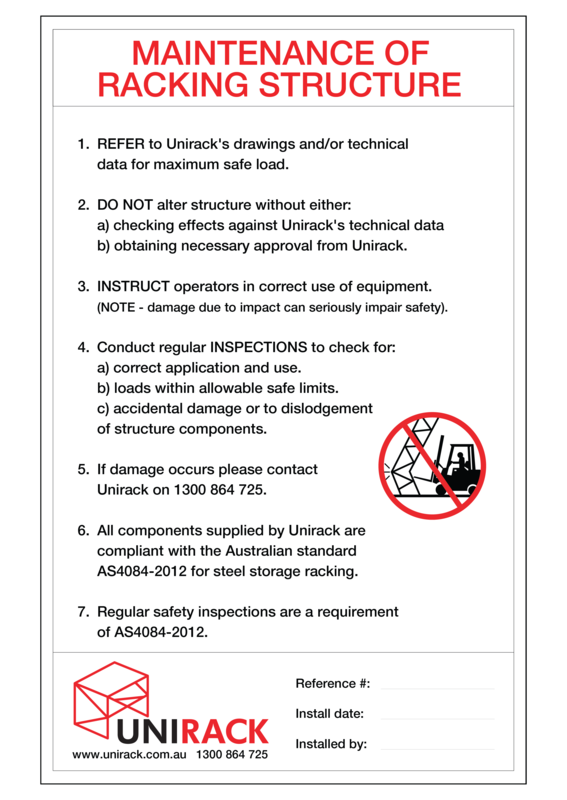 Signs, Alerts and Stickers The problem above is solved with good warning & information signs and stickers which alert your employees to the correct load limits. We supply these signs and stickers and can advise where they should be placed. Here are some of the warning signs. Click to enlarge.